The simple game which finds and touches a correct answer out of many state flags! The touch game of a state flag appears shortly! I will find a correct answer quickly from the flag of the state of 50! Don't fear a mistake! It also gives a speech! You will memorize a state flag by hearing and vision! Seal of state is also displayed moreover! It is still more detailed at Wiki! It corresponds to a twitter function and GameCenter! BGM which Sound of Love sends to you is "HOPE." A check with a global map is possible in the position of the state in the United States simple and clear [ the rule of memorizing and discovering an American state flag ], and intelligible. The idea of having promoted the simple study of "memorizing a state flag" to "the pleasant game" is an interesting application. Since the position of the form of a state flag, a color, and a state can be memorized, playing happily, it does not become pain at all. If a state flag is not kept in mind as the direction and general common sense that it is necessary to memorize a state flag by the test of geography or history, those who decided preparedness to be -- need to challenge.
" -- the state flag of a title -- the memorization -> -- the state flag of a title is discovered out of many state flags -- " -- what is said. In two distance of remembering the image which memorizes a state flag and of which & memory was done, the image of a state flag is firmly planted into your head. Since the position of an American state can be checked with a map if the right correct answer is drawn, if generous, let's also put the place of a state into the corner of the head in passing. They are means, even if it gives up and memorizes together with the friend of a class regardless of continuing stoically as an object for one persons. It may be interesting even if it fights [ Which discovers the state flag of a title previously? ]. 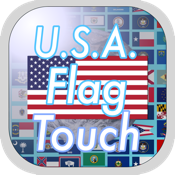 Since a state flag is memorized happily, those who got interested need to touch.